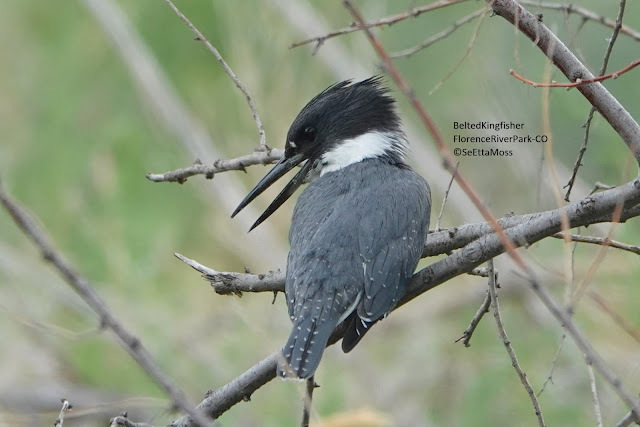 I photographed this Belted Kingfisher at Florence River Park from my car. As the bird was behind a number of tree and shrub branches it thought it was hidden so it stayed put about 30 feet from my car (they usually flush at that close distance)--of course those branches made getting a clear shot a challenge. I took all these pics from inside my car after driving up to about 40 feet from one Black Phoebe. 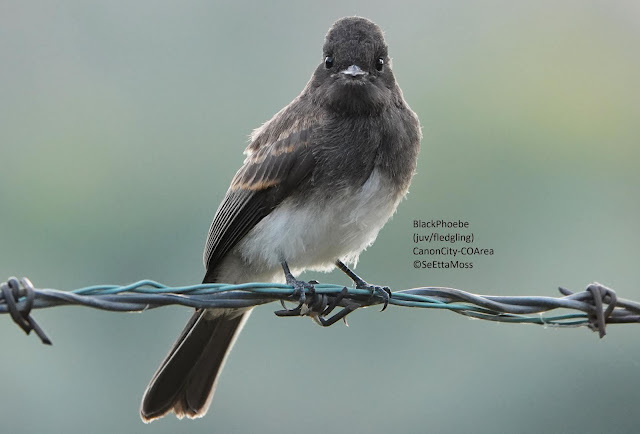 I waited patiently while it just perched quietly, then this juvenile Black Phoebe flew in to a perch less than 25 feet from me providing for such nice close-ups. The juvenile is in spanking new plumage and it's brown wing stripes (denoting juvenal plumage) stand out nicely. Just a bit of this fledgling's yellow flanges can be seen, but very small amount as this is clearly an older fledgling (ie, tail is not very short ). It is even starting to show the raised crown found on adult Black Phoebes. Also I saw the fledgling do some foraging on it's own, so it is close to gaining independence. The adult is feeding the fledgling in the pic above. Some of the insect that the parent bird fed to the fledgling is shown above.